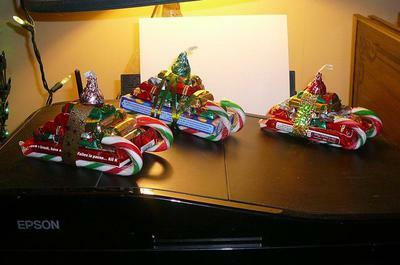 If you are looking for a cute and unique gift this holiday, try making these candy sleighs. The also double as great decorations for Christmas, and then, you get to eat them! The two candy canes will be on the very bottom of the sleigh, so arrange them on their side with their hooks pointing up, as the photo shows. Next, glue a KitKat bar on top, using hot glue. To add the presents, glue 10 small Hershey bars, or other types of mini candy bars to the top of the KitKat, using just a drop of glue (don't use too much, as you don't want to melt the chocolate!). Try gluing them in a pyramid shape, by placing four bars the bottom, then three bars next, etc. Finish it all off by gluing a ribbon around the “packages” and add a pretty bow on the top. 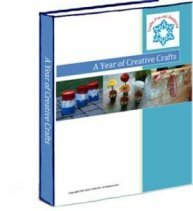 Now you have a perfect, yummy homemade gift!